University of Georgia Press, September 2016. Campbell further places these women writers in a broader context by tracing their relationship to early film, which, like naturalism, claimed the ability to represent elemental social truths through a documentary method. Women had a significant presence in early film and constituted 40 percent of scenario writers—in many cases they also served as directors and producers. 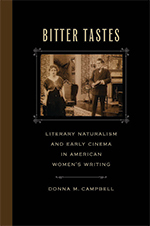 Campbell explores the features of naturalism that assumed special prominence in women’s writing and early film and how the work of these early naturalists diverged from that of their male counterparts in important ways. This entry was posted in New Books on July 25, 2016 by Donna Campbell. Emotional Reinventions: Realist-Era Representations Beyond Sympathy. Dawson, Melanie. University of Michigan Press, June 2015. This entry was posted in CFP on July 25, 2016 by Donna Campbell. The Edith Wharton Prize for a Beginning Scholar is awarded to Dr. Lina Geriguis of Chapman University for her essay “‘Rich in Pathological Instances:’ Disability in the Early Reception Theory of Ethan Frome.” Second place goes to University of Cincinnati PhD candidate Lindsey Kurz for “The Heroine of a ‘Queer Episode’: Gerty Farish’s Martyrdom in The House of Mirth.” Both essays are under consideration at the Edith Wharton Review for possible publication. Thank you to Drs. Melanie Dawson and Myrto Drizou for serving as judges and Dr. Meredith Goldsmith, EWR editor, for overseeing publication. Three (3) essays were singled out for the EWS Undergraduate Research Prize. First place is awarded to Angela Sammarone of Fairfield University for “‘On the threshold she paused’: Doors in Edith Wharton’s The Decoration of Houses and The Mother’s Recompense.” Angela wrote her essay under the direction of Dr. Emily Orlando. A revised version will appear on the Edith Wharton Society website. Honorable mention goes to Lauren E. Hayes of Framingham State University for her essay “‘More Real to Me Here Than if I Went Up’: Fantasy Visions and Fear of the Unknown in Wharton’s Summer and The Age of Innocence.” Lauren produced her essay under the direction of Dr. Carolyn Maibor. Honorable mention also is awarded to Jacqueline Bradley of the University of Wyoming for “False Freedom: The Constraints of Divorce in Edith Wharton’s ‘The Other Two'”. Jacqueline wrote her essay under the direction of Dr. Arielle Zibrak. Thank you to Drs. Sharon Kim and Shannon Brennan for serving as judges. The EWS Award for Archival Research is awarded to Dr. Bethany Wood of Southwest Baptist University for her project Adaptations Preferred: Gender Across 1920s Fiction, Theatre, and Film. Thank you to Drs. Meredith Goldsmith and Gary Totten for serving as judges. Please join me in congratulating our winners and a tip of the hat to the mentors who advised them as they produced their prize-winning work. Thank you also to our distinguished Wharton scholar judges for their important work assessing the entries which, by all accounts, were quite impressive this year. This entry was posted in Announcements, EWS Business on July 22, 2016 by Donna Campbell. Greetings from playwright Germaine Shames, a fellow admirer of the works of Edith Wharton. I’ve been meaning to get in touch. As part of a larger mission to adapt and re-imagine classic 19th and early 20th century novels either by women or with strong women’s roles and relationships, I have completed stage plays of three works by Edith Wharton: The Touchstone, The Muse’s Tragedy and Glimpses of the Moon. There are tentative plans to present readings of the first two at Wharton’s beloved Mount sometime this Fall. If the Edith Wharton Society ever has a use for the plays, I’ll be very happy to share them. As of this writing, they are still unpublished. On a related note, the ghost of Edith Wharton makes a cameo appearance in an original short play of mine, “Mirth.” As you may have guessed, the play references The House of Mirth. Thanks for all you do to keep Wharton’s legacy alive. This entry was posted in Announcements on July 6, 2016 by Donna Campbell.